We've been playing Marvel Puzzle Quest (available on iOS, Android, and Steam) for nearly two years now, and for the most part it keeps getting better and better. D3 Go and Demiurge have taken the stellar puzzle RPG dynamic from D3's earlier Puzzle Quest games and added new layers of strategy with Marvel-themed stories and quest lines. There's even a social aspect as players can team up in alliances and communicate in private chat rooms. 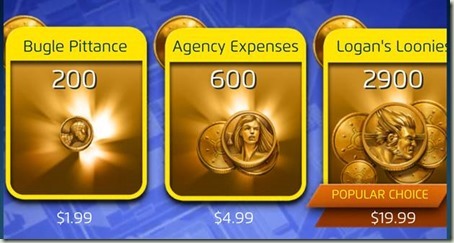 While technically "Free to Play," Marvel Puzzle Quest constrains key resources to drive you to spend money. You earn these awesome-looking comic book "covers" for free that deliver different characters and powers. You build up your roster of characters by winning and unpacking the tokens that randomly deliver these covers. 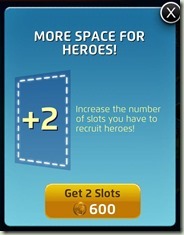 But roster slots - i.e., places to store your characters - cost an increasing number of Hero Points, which can be hard to come by. You'll get a certain amount just by playing the main story quests, and even more if you participate in Tournaments and Versus events. But make no mistake, if you stick with this game you'll eventually break down and put in $5 or more to accelerate your collection of roster slots. It would be nice if they provided a price break at $10 - that would be a great tip for a solid game - but it jumps from $5 to $20, and $20 is just a little steep especially when you're starting out. The game recently became much more generous in granting Hero Points, so $5 may actually be enough these days to get over the "my roster's overflowing" hump. Oh, and whatever you do, don't spend Hero Points on anything but roster slots. You will never collect all of the game's characters as it is, and wasting points on other things like upgrades and health kits only slows you down and fills your soul with regret. When you start out, you'll get Iron Man (Model 35) and soon collect Black Widow (Modern), Storm (Modern), and Hawkeye (Classic). Build them up to full strength because together they make a great starter set. Someday you'll sell off all but Iron Man (he's the sole 1-star character worth keeping long-term and the only character you'll need to beat the 1-star challenge in Deadpool's Daily). You'll get through the main story quests fine with these four covers (plus whatever else you pick up along the way): Black Widow's ability to freeze enemies plus Storm's elemental attacks are pretty powerful, and add either Iron Man's power attacks or Hawkeye's strategic strikes to mop up most enemies in the early rounds. After the main story, you'll dive into Tournaments, which last from a couple of days to a week and are best played with an Alliance (more on that in a bit). By this time, your power trio will probably be Magneto (Marvel NOW! ), Storm (Classic), and Hawkeye (Modern). Magneto's purple Polarity Shift attack will give you blue tiles that can be placed to create Critical tiles, which do tons of damage and kick off Hawkeye's devastating Speed Shot attack. Plus the blues can power Storm's even more devastating Wind Storm, which freezes a selected enemy and damages all active opponents. Stack a couple of those, and you can win almost any battle while taking little to no damage. Eventually you'll develop some good secondary teams - such as Thor (Marvel NOW! 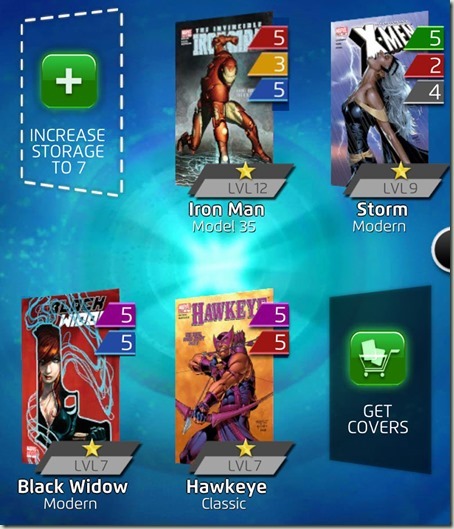 ), Captain Marvel (Ms. Marvel), and Black Widow (Original) - that you can use when your primary heroes are resting. There are many more great combinations. Experiment to find your own, and share them with us all in comments! Speaking of resting heroes (and stuff I wish someone had told me when I started), you can also hoard Health packs but it's not recommended. That's because Health packs regenerate over time whenever you're below five of them. So use them to jump right back into the fray anytime your favorite heroes will take more than a few minutes to heal. Health packs are restored every 35 minutes until you max out at 5 - so when they run out you may need to take an hour or so break, or choose your B-team and keep going. Initially, you'll be inundated with tokens (which give you covers) and Iso-8 (used to level up your roster) but you don't have to spend it. You can collect 99 tokens before maxing out, so let them pile up! Until you redeem them, they won't expire - just spend some each time you get close to 100. Once spent, characters will expire in 14 days if you don't find a roster slot for them. If you play tournaments, it's a good idea to hang on to covers you don't have a space for just in case they become Essential (i.e., required for a particular battle, usually one that's easy and delivers better-than-average rewards). When this happens, you may opt to trade a lesser used character or reviled team killer (looking at you, Sentry!) for someone who suddenly has at least short-term worth. Convert any covers you don't want or need before the expiration date to Iso-8, which does not appear to have a cap. I once saved up 100,000 Iso-8 just to see if it maxed out, and it didn't - at least not there. Perhaps it stops at 999,999, but odds are that you'll never keep that much lying around. Once you have an expansive roster and start playing Deadpool's Daily, any Iso-8 glut you have will be gone in a hurry. There are two types of battles in Marvel Puzzle Quest. You're either fighting Grunts (ranging from mafia to soldiers and even ninjas), who do not make moves, or Characters (sometimes paired with Grunts) who do get moves. Either way, if you don't know your enemy's powers, you're at a disadvantage. Take the time to explore the enemy's attacks and defenses, and keep an eye on their Action Points (AP) to see when they have enough of a particular color to use a power. If you have a power that saps their AP, you can sometimes use this to your advantage. For instance, when fighting with She-Hulk you can repeatedly use her Green power to reduce the enemy's largest AP stash before an attack can even be unleashed. If you're fighting Grunts, you don't have to worry about setting up a great 5-in-a-row match for your enemy to steal. You can map out your next move to devastating effect, but you need to keep an eye out for countdown tiles that will wreck your plans. I tend to divide up identical enemies (e.g., two Soldiers paired with a Hitman), taking one of the twins out first so it's easier to determine who owns a particularly nasty attack. Then I can focus on taking that enemy out before his or her attack can go off. When playing against Characters, you're trying NOT to set up a great next move and hoping that your enemy (whose AI is pretty dumb and misses all but the most obvious matches) sets you up with a great combo. Finally, there are multi-wave battles that have enemies waiting in the wings to take the place of a fallen comrade. These can have up to 5 stages, so it's a good idea to reserve your best powers until they're really needed. Grunts can often be cleared just with careful matching, letting you save your powers to paralyze Characters before they can even make a move. At the start of each battle, it's important to take a moment to orient yourself and select the right strategy. I can't tell you how many times I've wrecked a great next move for myself before realizing that I back to fighting Grunts, who could not possibly have taken advantage of it. In multi-wave battles, you need to be prepared to survive a marathon (not a sprint) and anticipate the appearance of overpowered Character enemies by having AP reserved to neutralize them quickly. 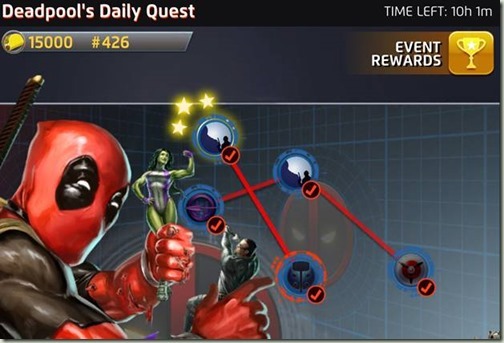 Since battles in Marvel Puzzle Quest aren't timed (except when playing in tournaments that are about to end), you can typically plan your next move without the pressure of a twitch game. Use this to your advantage to really evaluate your options when tasked with a difficult battle and a board that has several different potential moves. Join an alliance to socialize and get free stuff. Your alliance's cumulative score in a tournament earns prizes for everyone in the alliance. Team-ups and Boosts, what's the difference? In the beginning, there were Boosts. They max out at 30 per type, so you can hoard up to a point and then spend them somewhat generously when needed. 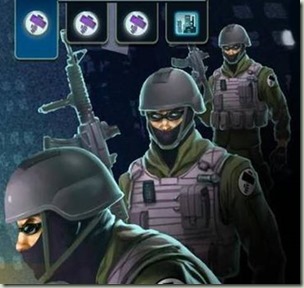 You typically use them to overcome a tough battle that seems stacked against you by granting bonus damage for criticals, or giving you a leg up with some key AP to power your best attacks or defenses at the start of a battle. 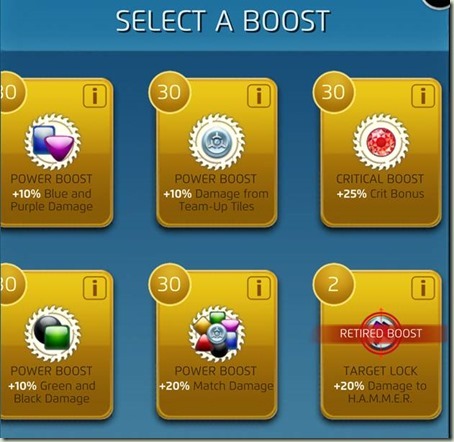 Boosts can be stacked for additional power, though they are generally capped to maintain some semblance of game balance. Then the developers tinkered with the formula, adding Team-ups. These are sometimes won at the end of battles against characters (chosen from among the characters you defeated). You can select them and then use them or not in a battle. Unlike Boosts, which are modify your pre-battle state and are thus burned when you choose them, Team-ups remain in your inventory if they are not needed. Team-ups are capped at 20 total (they don't stack like Boosts), and managing them can be tricky. You have to go in right before each battle and delete any you don't want, just in case you earn a new one (rather, than, say offering the option to trade a crummy one out at the end of a battle). Also, you can share Team-ups with players in your Alliance. It used to be that you couldn't use them for a spell once shared, but to encourage widespread sharing the developers removed the penalty so you can share up to 5 in a day without losing access to them yourself. Shared Team-ups get a timer that must run out before they can be given again, but you can still use them regardless. You can mix and match Boosts and Team-ups, but you can only have three different ones active at a time - so choose wisely. Any unused slots are randomly filled from your available Team-ups. I personally avoid Team-ups except as a last resort to help win a battle that's too close to call but could be lost with one unlucky move. As a result, I have plenty to share but have to frequently prune my collection - keeping only those that are really useful to me in a tight spot. 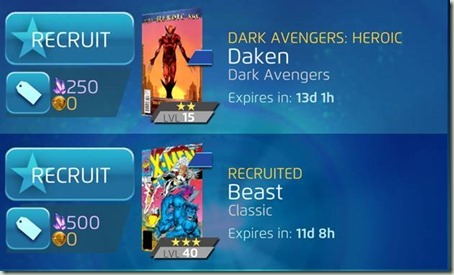 You don't have to connect your Marvel Puzzle Quest account to Facebook, but there are advantages if you do. First, your game progress is backed up so if you ever have to reinstall, you won't risk losing your roster. Second, you can send bonus items such as tokens, boosts, and Iso-8 to friends who also play. Just be sure to check that your friends are really playing. In Facebook, they look like those annoying help request notifications but they are really bonus items being transferred to your friend's game. But if your friends only linked up the game and haven't played much, they may think you are spamming them. If you have more than one mobile device, you can use the Facebook connection to link your devices and sync your saves. It's a little harrowing since the interface and FAQs aren't super clear, but it appears that your second linked device will only load the progress from your first linked device. So make sure your primary game is backed up, and then - after you complete the tutorial on your second device - you can go to settings, select Facebook, and Load your first device's progress. After that, your progress should be sync'd after every battle regardless of device. And, alas, no - at this writing there's no way to sync between PC and mobile games. I personally think tablet is the way to go. The game plays great with a large touch screen. Playing on most phone screens is a nuisance, but it may be a good way to keep up with your game or kill a few minutes (and super villains) while on the go. The Steam game is great too, but you're locked to playing on your computer, which isn't the ideal place to grind while watching TV or riding on public transportation. 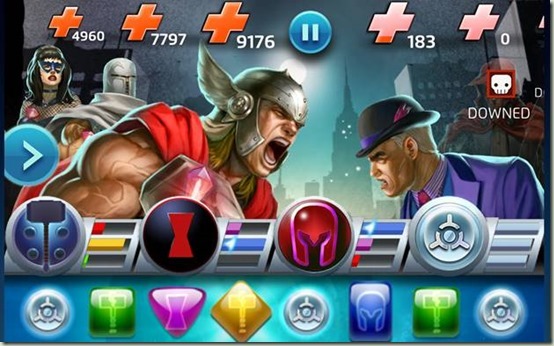 Major game mechanics in Marvel Puzzle Quest have changed several times over the years, and no doubt will again. Character powers get rebalanced from time to time, so your favorite attacks will lose their punch. 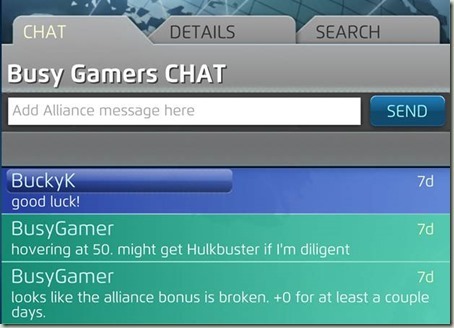 Commiserate in your Alliance chat room (if you have one) and then get back in the game. Despite many severe shifts in gameplay, it remains one of the best puzzle games ever. Get over it and keep playing. One of the biggest problems with Marvel Puzzle Quest is that when you start out, the deck is stacked against you in Tournaments. You often need Essential characters to get scores high enough to win the Essential character cover being offered as the ultimate reward, so people who missed out last round will generally miss out this round too while people who won last round will get an extra stripe for their rare character. But it won't always be that way. You will eventually catch up and have a shot. Deadpool's Daily gives you good odds of winning semi-rare characters and Hero Points with Taco Tokens, so do this as often as you can. You can then earn extra stripes for them (once you have Dat Required Character). Versus is another avenue for winning rare characters, but you have to pick your battles with care. Also, once you play a Versus battle, you'll get challenged yourself and loses will eat away your rewards progress. Just hang in there, and eventually you'll find yourself on the receiving end of this game balance inequity. At least some of the time. And when you're not, well, hopefully you're having fun and won't mind too much. Thanks for the feedback on Twitter and Alliance chat. The Pikachu Fan wrote up some notes, which also helped me address a few sections that were slightly confusing (particularly around Team-ups). Let us know if this guide helps, who your favorite teams are, and any other tips or thoughts you might have! This page contains a single entry by Gamewatcher published on May 16, 2015 12:05 PM. Busy Gamer Nation #231 - The Order: 1886 was the previous entry in this blog. Sneak Peek - I Love Bees Definitive Edition Trailer and Samples is the next entry in this blog.